A man, a martini, and a lot of microphones. : About Damn Time!!! June Foray wins an Emmy! About Damn Time!!! June Foray wins an Emmy! If there's one thing that gets me, it's the lack of love (or so it seems) that the industry has for voice actors. Bob Bergen makes a very strong viewpoint on this, and frankly I'm inclined to agree with it. So it gives me great pleasure when I hear about the entertainment industry recognizes one of our own. It doesn't happen often enough from outside of the VO ranks, so when it does I think it's worth lauding. 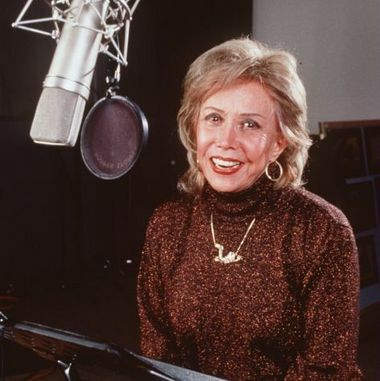 Voice over legend June Foray took home her first Emmy for Outstanding Performer in an Animated Program for her performance as Mrs. Cauldron in "The Garfield Show" on Cartoon Network. This is one role in Ms. Foray's prolific voice over career (she's still rocking the mic at 94 years young), and to me this is an award that's been long overdue to her. Congrats June!!! For those who are interested, there's more info here. I should say that it is unfortunately the truth of this industry that people do not recognize or even do not think of voice over artists due to whom the people promote their brands on TV and radios and kids enjoy watching animated films and cartoons. But I am really delighted that at least June has been figured out for her outstanding services to this industry. She really deserved this great award.